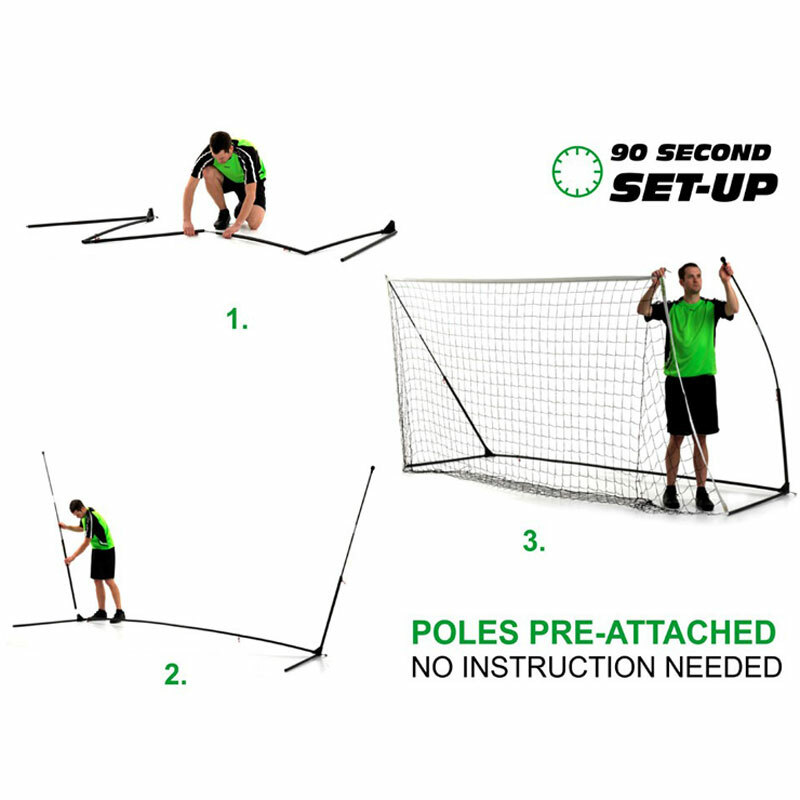 The Quickplay Kickster Academy Futsal Football Goal 3m x 2m (10ft x 7ft) is the lightest and quickest to assemble real goal of its size - anywhere. Ideal for young players aged 4 to 7 years or for improving shooting and ball control skills for any amateur player, when you need a more challenging target size to shoot at. Perfect for the garden, park, beach or anywhere. 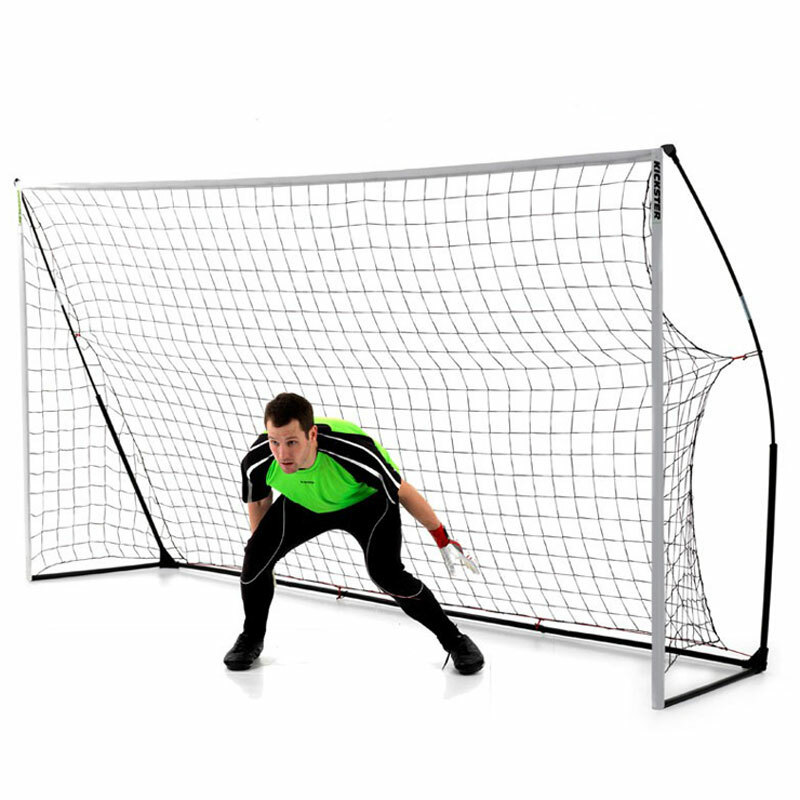 Small pack size and lightweight- ½ the size and weight of other portable futsal goals on the market. Perfect for improving shooting and ball control skills for any amateur player. Lightweight, strong and durable due to the steel and fiberglass construction, it is able to withstand pretty much everything that is thrown (or kicked) at it. Disassembling is just as straightforward as the initial setup. Assembled size - L 300cm x H 200cm x D 100cm (10` x 7` x 3`). Pack size - 19cm x 12cm x107cm. Please note that these goals are sold individually. Easy to assemble and a great height to limit it going over the garden fence. The goals are great! Easy and quick to assemble. Can be used inside or out. However, the bag they come in is not the best. These have been replaced by the manufacturer. Would recommend. Purchased 2 of these a few months ago, use them for all sorts and they've thus far stood up to the rigors. Easy to set up and take down-doddle. Strong, easy to set up, I could afford it I would have bought the bigger size. But still suitable for my 11 and 9 years old boys! Since we received it, we keep going to the park with it! Very happy Kids and mum! They are easy to put up and serve their purpose. Unfortunately the storage bags are a bit flimsy and mine tore the second time I used it. Great goals, quick & easy to put up. Only improvement could be if they weighed less but the steel frames are robust. Thanks Newitts and the makers of Quick Play. Very good, compact, lightweight does the job well. Just a note to say the goal has a black frame, black net with a white front. Looks pretty cool but different to advertised photo. V Happy Though!